Application: DC & AC capacitor manufacturing units for spraying the ends of wound elements of capacitors. Only special high-grade Zinc Ingots of minimum 99.995% purity are used to manufacture. The wire has a variety of applications and is used in different industries in India and abroad. - All diameters like 3.15/2.00/1.60mm & even down to 0.30 mm. We commence our business as the leading organization of the best quality 2.8mm Pure Zinc Wire. - Inner diameter of the coil ranges from 300 to 600 mm. Backed by enormous industrial expertise, we have become a renowned firm of Zinc Wire. These products are manufactured using the finest quality raw material and highly up-to-the-date tools at our manufacturing entity. These offered products are highly admired for their sturdiness. We offer these products in many specifications. 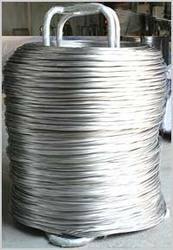 We are offering Electroplated Wire which have under given technical information. 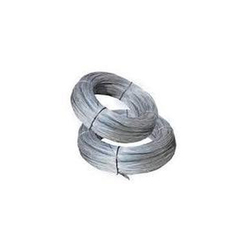 - Galvanized iron wire uses in weaving of wire mesh, fencing for expressway and construction. - Purity is more than 99.995% with low percentage of impurity. - The surface of wire should be clean, smooth, and free from blister & roughness. Zinc Wire manufactured sizes 4.75 mm dia upto 0.40 mm dia. Tin/ Zinc wire used for metal spraying. The most common application is found in Dc & Ac capacitors manufacturing units for spraying the ends of wound elements of capacitors.